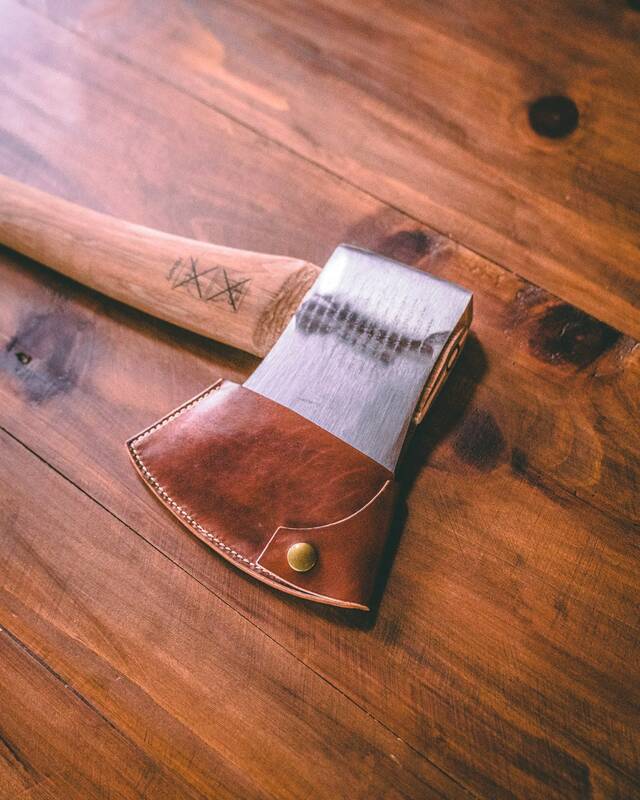 This is a handmade leather sheath for the Arvika 5-star Racing Axe. It is constructed out of 5oz veg tanned leather, hand dyed a golden brown with a oil based leather dye, and stitched by hand with Tiger thread. Finally all the edges have been burnished to create a long lasting, good looking leather sheath to protect your beautiful Arvika Axe...and to protect you! These are made to order: I try to complete no later then 3 days after I receive the order. If more time is required I'll contact you. 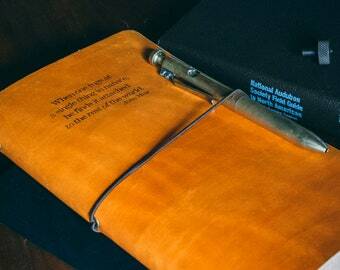 Leather travel journal notebook, Midori style journal with John Muir quote on cover. Quality leather, well made, fits perfectly -- I'm quite pleased! Beautiful old world craftsmanship combined with timeless design. Travel Journal Starter Package, Midori sytle journal with handcarved Mandala on front cover. Awesome craftsmanship. Thank you so much! 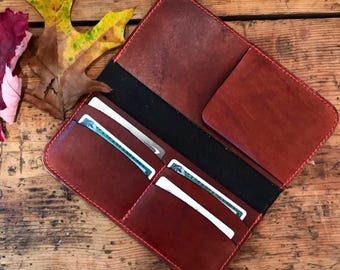 This wallet looks amazing, exactly as pictured! The basket weave pattern and contrasting stitching definitely give it a cool old school look. The leather smells great as well. Fast shipping would buy from again. Unless otherwise agreed on, items will not ship until payment has been made in full. Personalized items containing your initials, or other buyer specified wording that is stamped or burned onto the product will not be eligible for a refund. Belt's that were ordered, and made to the the buyer's specifications for size, will not be eligible for a refund if the belt doesn't fit due to incorrect measurement. Will ship once item is paid for. Many orders that I make are of items that I do not have in stock. Additional time is needed when making a custom order piece. Please be patient while this process is happening, I promise the wait will be worth it! I’m happy to discuss custom leather work with you and will work hard to insure I’m creating what you want. For hand carving designs the more detail you can provide the better; pictures and exact measurements are very helpful. Custom work takes time so please be aware of this when planning a gift.